The game has come a long way since the U.S. hosted the 1994 World Cup. Now Copa America is here. The United States may still not be a major power in international football but a glance back to the last time the country hosted a major international football tournament, shows there has been close to a soccer revolution here in the past two decades. 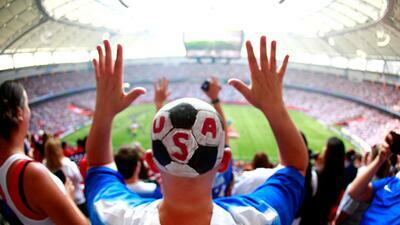 A survey conducted by Sports Illustrated in 1991 found that just nine percent of Americans “followed” soccer. The statistic was hardly surprising given that there really wasn’t much soccer to “follow” - the professional game in the U.S. barely existed at that time and international matches were rarely broadcast on television. A game between Mexico and the United States national team, now one of the most passionate rivalries in the sport, drew a crowd of just 6,261 in 1991. Worse for those trying to get support for the game, the view of many was that soccer had already been tried - and failed. The North American Soccer League (NASL) had burned brightly in the mid-1970’s, with the presence of stars such as Pele, Franz Beckenbauer and Johann Cruyff. For a brief spell, large crowds turned out to watch teams full of foreign players, attracted by handsome salaries. The games were broadcast on national television and kids, who had long played the game, finally had some heroes to look up to. But with no solid business structure for most clubs, other than Pele’s famous New York Cosmos, the league collapsed in debt in 1984, with only two teams wishing to continue playing. The American Professional Soccer League (APSL) tried to pick up the slack but its teams were, in reality, little more than semi-pro and games drew tiny crowds of 2-3,000 with clubs coming and going once again. Those with the ability and desire to play the game for a living, were forced to try their luck anywhere they could, with small contracts in Eastern Europe or Mexico, often the best they could hope for. Domestically many players turned to the relatively popular ‘indoor leagues’ for contracts. Yet still FIFA felt that it was worth another try to ‘crack the American market’ and see if a World Cup could popularize the game in a country that was viewed by many outside as a “barren land” for the sport. The tournament drew huge crowds - it still holds the record as the best attended World Cup ever - but for those travelling to the U.S. from abroad, it was clear they were in a ‘non-soccer’ country. Mike Collett, Reuters global soccer editor who has covered nine World Cups since 1982 remembers the 1994 finals as the only one that failed to truly capture the imagination of the public. "The 1994 finals almost existed in isolated bubbles around the stadiums where the matches were played,” he said. "Walk into a sports bar and only U.S. sports were on the television and there was a reluctance of the bar manager to switch to World Cup coverage," he added. "The atmosphere in the stadiums was also strange," said Collett, who recalled how fans cheered long goal kicks, identifying them long kicks in American Football. "There was very little appreciation from American fans of the finer soccer skills although naturally the fans of the teams playing understood exactly what was going on. The home fans seemed largely bemused and were just there for the occasion." But still, by having the World Cup in the U.S., the seeds had been sown for the real growth of the game and many fans cite 1994 as the year they finally caught the ‘soccer bug’. Part of the deal for bringing a World Cup to the U.S, was a commitment to create a fully-fledged national league - and in 1996 that came to fruition with the creation of Major League Soccer. The league initially had 10 teams and featured the bulk of the 1994 U.S World Cup squad, along with a sprinkling of foreign players such as Colombian Carlos Valderrama, Mexican goalkeeper Jorge Campos and Italy midfielder Roberto Donadoni. Claims from some in the mainstream sports media that Americans would not turn out to watch soccer on a weekly basis proved unfounded -- the league averaged crowds of 17,406 in its first season with the LA Galaxy averaging over 29,000. While costs were kept down, the league's low salaries which were as little as $10,000 a year early on were a deterrent to foreign players, ruling out the chance of a repeat of Pele's inspirational time in New York. That changed in 2007 when LA Galaxy grabbed global attention by signing England midfielder David Beckham on a $6 million a year deal. The 'Designated Player' rule allowed for each club to sign a star player on a wage that would not be counted against the salary cap and the New York Red Bulls followed suit by acquiring former France and Arsenal forward Thierry Henry from Barcelona. The league continued to add new clubs with Seattle Sounders, soon to be averaging over 40,000, heading the soccer boom in the Pacific Northwest along with the Portland Timbers. MLS now has 20 teams and many have built their own ‘soccer specific stadiums’, so they no longer have to play in huge NFL venues, several clubs now have academies to develop their own talent. The expansion of the league is expected to see it grow to 28 clubs in the next decade. Adding to the growth of the game, the development of women’s soccer in the States has been in many ways well ahead of the games traditional strongholds in South America and Europe. The U.S won the women’s World Cup in 1991 and 1999 - the latter triumph coming on home soil. After success with Olympic gold medals in three straight tournaments, a third World Cup success came last year in Canada. Unlike in 1994, when international soccer news of any kind was tough to find, fans of foreign clubs can now watch games broadcast from around the world on a range of television networks and internet streaming services. No longer is the United States isolated from the global game - indeed as the hosting of the Copa America Centenario shows, it is now very much in the centre of the sport - after a long journey.